The day before the big night, a group of us met at the hall to begin transforming it into a venue worthy of hosting an Autumn Ball. Under Laura’s guidance, we covered chairs and tables, arranged pot plants, strung up fairy lights, spread crispy red and orange leaves on the tables, displayed menus, lay cutlery, fluffed and generally jujjed the place up. By Saturday evening, the inside of the hall looked magical and so did its occupants – all dressed up in their finest apparel. Even the men, wheeling large eskies behind them as they arrived, looked spiffy in their dinner suits. Many of the girls were wearing dresses they’d bought locally, either from our Op Shop or from Vintage Magnolia, a local treasure trove of pre-loved and vintage clothing, furniture and collectibles. Michelle, the owner, had even done a window display to help promote the Ball. I’d had my eye on a burgundy velvet floor-length dress at Vintage Magnolia, but by the time I’d got back to the shop to try it on (friend in tow for a second opinion), the dress had already been sold. When Kerry walked into the hall, wearing the very dress, I complemented her on how beautiful she looked and how gorgeous the dress was, and secretly cursed my tardiness. I had however managed to find myself another dress in the vintage shop. It was blue and sparkly. There was a little purse for $1 in the Op Shop to complete my out-fit. I’m guessing there may have been a few girls there who spied their own pre-loved dresses which they’d donated to the Op Shop, only to find them adorning another body. In our community, as far as clothes go, what goes around, comes around. We had the same band from last year’s Winter Ball, led by Greg Agar, and again, they were the highlight of the night. Just superb. From the moment the band starting playing their first tune, people’s toes were tapping and they couldn’t resist getting up on the dance floor. About a dozen couples swooshed and swayed their way through the Dinner Set – usually reserved for ‘background music only’. Apparently it takes a professional musician to really appreciate how unusual that is. The band’s repertoire kept everyone happy. At one point, we had people in their 20’s through to their 80’s all sharing the floor, including, it must be said, a number of males who’d sworn they never dance, “not for anyone”! The first function to be held in our hall was in the January of 1912 – it was an exhibition of local crafts and produce. A sedate affair I suspect, and no doubt many of the people wandering around the displays that day would have been horrified if they could have seen us all, 102 years on, dancing, twirling, jiving, stomping, cheering, and even (yes, even) break dancing. Greg and his band, on the other hand, thankfully, seemed to appreciate our moves. Here’s a photo he took – a little something to remember us by. If you attended the Ball and you’d like to see more photos, visit the Autumn Ball gallery here. 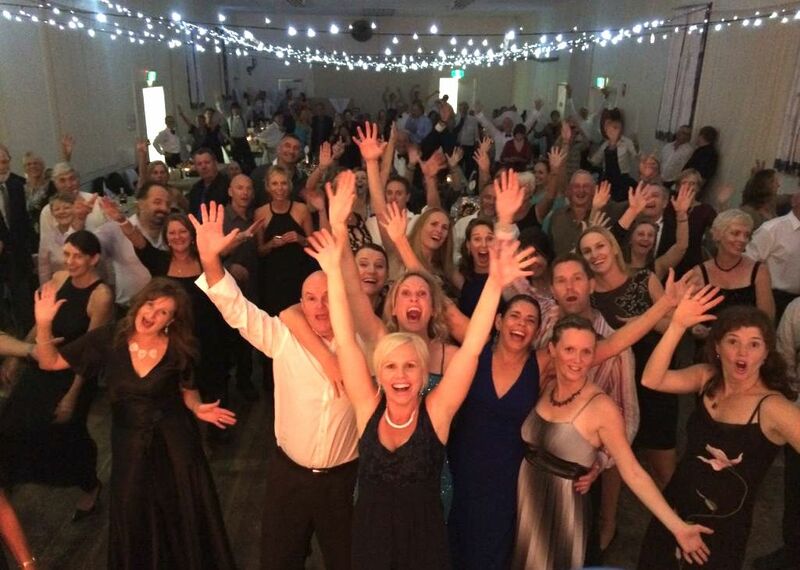 This entry was posted in Life in a small community and tagged Country Ball, country halls, local community hall, Nabiac Autumn Ball 2014, Nabiac Ball, Vintage Magnolia by Bec H. Bookmark the permalink. Never underestimate the enthusiasm of a few “chicks from the sticks”. Well done girls!!! Looks like a blast – sorry I missed it. I am still ‘shaking’. Thank you Greg and ACDC! Fantastic Review! Actually felt as if I had been there. I feel sure your No 3 Nabiac Ball is already on the Drawing Board. What a wonderful Community you enjoy . Long may this remain. Thank you Ellie. Perhaps you’ll be able to join us for the next one? !